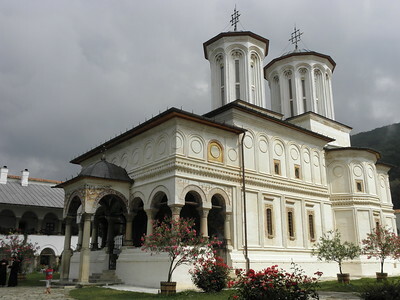 The Monastery of Horezu is considered the masterpiece of the Brancovan style that influenced art across the region in the 18th and 19th century. The monastery was founded in 1690 by Prince Constantin Brancovan, who let it be adorned with wall paintings and other rich decorations. The interior work was done by the Greek artist Constantinos, who also founded an acclaimed school of painting in Horezu. The tradition of Mount Athos, which artistic creations were made possible by a system of patronage, was an example for Wallachia and Brancovan. The Brancovan style that developed under these circumstances is a synthesis of Byzantine and Northern Italian Renaissance architecture. The main monastery consists of the central main church (catholicon), around which the other buildings are grouped: a refectory, two-storey monk’s cells, bell-tower and the prince’s residence. They are enclosed behind a wall. The designated area also holds another church (Bolnitei) and two hermitages outside the walls. Since 1872 this Monastery is in use as a Nunnery. The Horezu Monastery is located about 2 hours drive south of Sibiu, on the road to Targu Jiu. I hadn’t found much visitor information beforehand, so I just hoped it to be open on a Monday morning in late August. When I arrived there were only a couple of cars in the parking lot, and one single souvenir stall out of a row that was open. It’s not a site that appears to be visited by hordes of tourists, certainly not foreign ones. You have to walk uphill to get to the monastery. Entrance is via a gate in the thick surrounding walls. You can just walk in, there’s no entrance fee and it does appear to be open every day (as it is an active nunnery). From the gate my attention was immediately drawn to the church in the center of the grounds: it is very white and a bit odd shaped (I had seen that already on pictures), and its front portal is completely covered by wall paintings. Clouds had been covering the sun for most of the morning, but fortunately the sun came out now to brighten up my pictures of this very pretty site. I slowly walked around in the enclosure, which isn't very large. Under the bell-tower is a small refectory, almost like a cave. It holds a table and about 40 chairs, and its walls are completely covered in paintings. What a place to eat every day! The Last Supper is depicted here too. Several black-clad nuns were ambling about, doing their daily business of which gardening seems to be an important part. The grounds are well kept and adorned by flowers and plants. I ended my visit at the church, where I first sat down gazing at the frescoes at the entrance. The crowded scenery depicts mainly mythological scenes. The interior of the church consists of two parts: the first holds wall paintings of the monastery's patron, Prince Brancovan, and his family. At the end there is a massive wooden altar. In all, I spent about an hour at the monastery. It's located quite far from any other sights (although there are other monasteries in the area). So I just had lunch at Horezu Town, of pottery fame, and after that made my way back to Sibiu. Horezu was our first visit in Romania, and our first encounter with an Orthodox monastery since focusing full-time on World Heritage sites. It's quite an enjoyable site - the walls hiding a brightly-painted Katholikon surrounded by flowers. 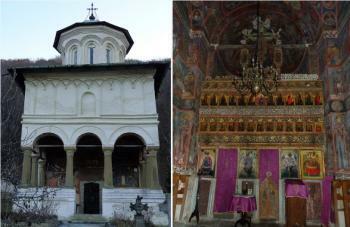 The portico and interior of the church are both covered with bright paintings done in the "Brâncovenesc style", considered to be the only original Romanian art form. Unfortunately we couldn't film inside, but managed to get some fantastic shots on the portico. Make sure you head out behind the main church, through the gate and up the hill. Here there's another small chapel covered in paintings, and you can really see how much of the monastery's original outer wall has been destroyed. I visited the Monastery of Horezu WHS at about 8.30 on a Wednesday morning in early January 2017 by a rental car. Anybody was able to enter the monastery compound freely for free at that time. There was some sort of service going on in the main church of the monastery, in which photo is not allowed even without flash. I walked around the compound to find a small chapel (photo left) further up the hill. The entrance had double doors, a grill door first and a wooden door second. The grill door was locked, so I could not enter. But the wooden door was open, so I could see what's inside through the grill door. There was no sign for no photo, so I was able to get a snap of the interior (photo right). 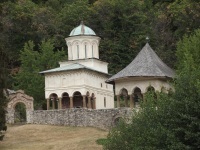 This monastery is attractively located in the hills 4km north of Horezu village. Els' pictures accurately depict the buildings and frescoes, but I liked the small chapel beside the cemetery. I reached the site by taxi from the bus station in the village. Buses link the village with railway stations at Petrosani, Craiova and Ramnicu Valcea.